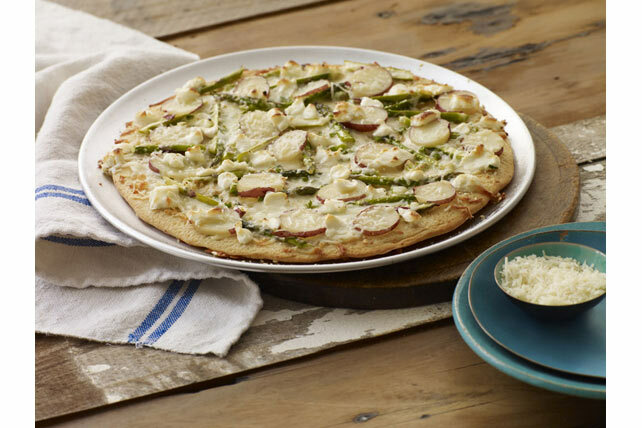 Cream cheese is the key to a shortcut white pizza sauce, while hearty potatoes, melty cheese and fresh asparagus bring restaurant fare into your kitchen. Cook potatoes in boiling water 15 min. or just until tender. (Do not overcook.) Drain potatoes; rinse with cold water to cool completely. Drain potatoes again; cut into thin slices. Roll Perfect Parmesan Pizza Dough into 12-inch circle on lightly floured surface. Press onto bottom of 12-inch pizza pan sprayed with cooking spray, stretching dough as necessary to fit. Let stand 10 min. Meanwhile, mix garlic and oil. Spread pizza crust with half the garlic oil; top with half the onions and mozzarella. Toss asparagus with remaining garlic oil; spread over pizza. Top with potatoes, Parmesan and cream cheese, broken into pieces. Bake 15 to 18 min. or until crust is golden brown. Sprinkle with remaining onions. Prepare a large crisp mixed green salad, chock-full of vegetables, for everyone to share. Don't have a brick of cream cheese on hand? Simply crumble 1/3 cup PHILADELPHIA Cream Cheese Spread (removed straight from the fridge) over pizza instead.